Cape Town is one of those cities that I have been seeing photos of forever. Thanks to its spectacular setting, it makes for quite a photo. On arrival it was obvious that it’s not just pretty in photos. This is a crazy beautiful city. There are spectacular views everywhere. The photos don’t do it justice. I felt like I spent half the time walking around with my neck craned up looking at the views. It’s also a city full of fun things to do in Cape Town with kids. From the must do (like Table Mountain) to the crazy fun (like Blue Train Park) to the moving (like our Township walking tour), this city will make sure you are not bored and that you will all learn so much. It’s also incredibly good value. Coming from Australia, things were cheap and high quality. The people are also very friendly and helpful. The first time we stepped out of our apartment, someone walking past said hello and welcomed us to Cape Town. There’s really nothing to dislike about a visit to the Mother City and it is well worth a spot on your bucket list. 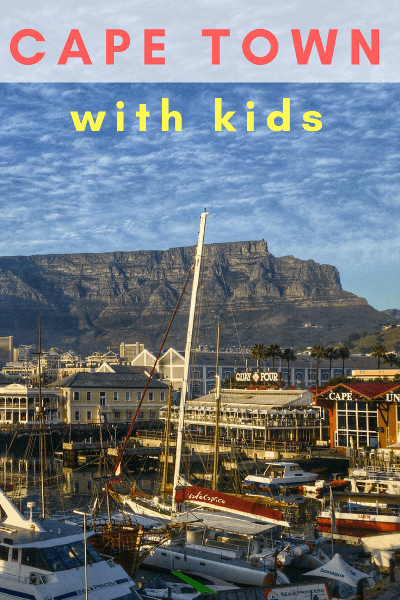 Below you can read my guide to what to do in Cape Town with kids, how to get around, how much money you might need, where to stay and other things for a great visit in Cape Town for kids! 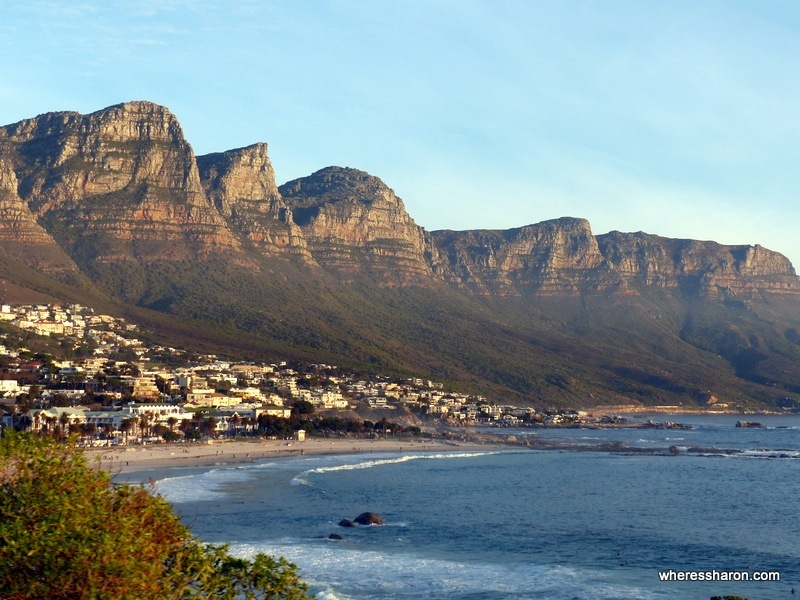 Our favourite of the family things to do in Cape Town is surely the most popular of the Cape Town tourist attractions – visit Table Mountain. You won’t have trouble seeing Table Mountain as long as it’s a clear day. The mountain was visible most of our time in the city. It’s interesting seeing it from different angles too. From the back, it doesn’t look anything like the “table” we’re used to seeing in photos. If you are travelling with kids you are definitely going to want to skip climbing up yourselves in favour of taking the cable car to the top. I must admit, the cable car was a bit of a disappointment. They fit a lot of people into it so it was hard to take in the views especially on our way up when it was crowded and we picked a bad position. Keep in mind when you’re working out where to stand that the floor rotates clockwise. We ended up facing the mountain itself for the majority of the journey which was disappointing (although admittedly still interesting to look at). Being at the top is brilliant, however. There are many great pathways and viewpoints. It’s fun to wander around taking in the views and enjoying being on top of the world famous Table Mountain. There’s a shop and restaurant. When we visited, it was the school holidays and kids were free which was a handy bonus. They were also given a special little activity booklet with coupons for free lollies from the shop and restaurant. There are buses to the starting point for the cable car. We caught the City Sightseeing bus here (more below) which made it very very easy. When we visited, tickets were ZAR255 for adults and kids would have been ZAR125 if we had to pay. You can book online beforehand although we had no problems buying tickets on arrival but it was a Tuesday morning. Make sure you pick a clear day for your visit for the best views. 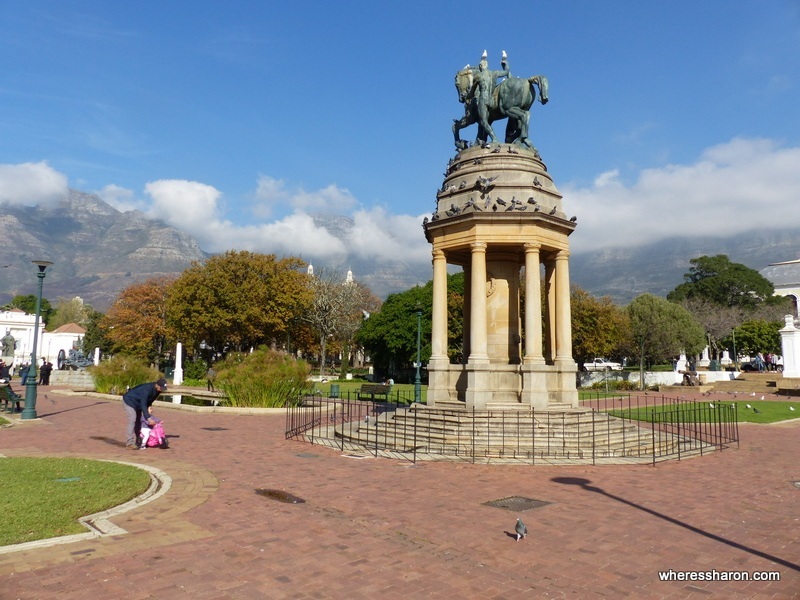 One of the easiest and most pleasant things to do with kids in Cape Town is to visit these gardens which are an easy walk from any of the attractions in Cape Town. These shady, green gardens are beautiful especially when Table Mountain is visible in the background. They have a good atmosphere and come complete with squirrels and ducks running around. There’s the option to buy food to feed the squirrels and this seems to have helped them become extra friendly and it was easy for the kids to get close to them. There are also monuments, a big vegetable patch and various trees and plant life. There are also some big swinging pods which the kids loved. These gardens were a good way for the kids to let off steam between the places to visit in Cape Town. 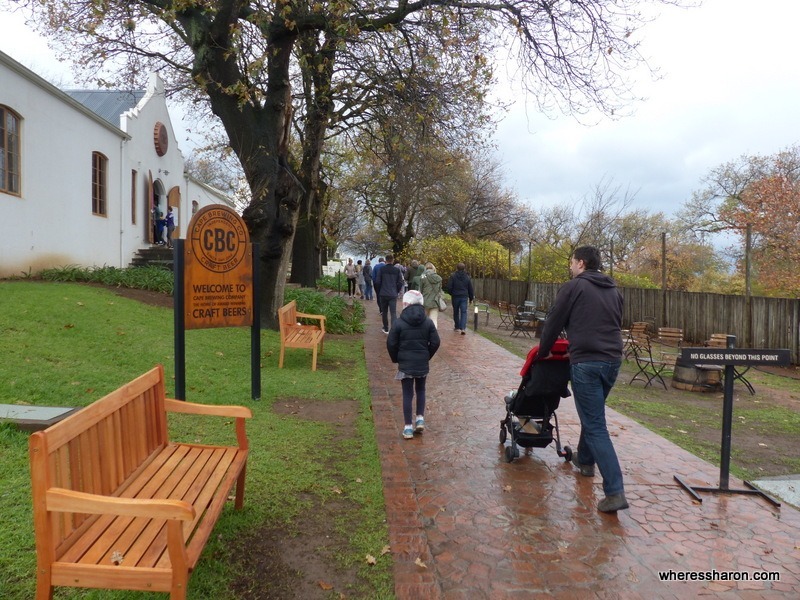 Another option of what to do in Cape Town for kids is the South African Museum conveniently located at one end of the Company’s Gardens. This museum is home to many big, clearly labelled exhibits, mainly detailing natural history especially that of animals. 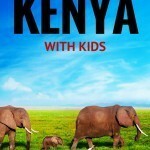 This made it interesting for the kids who enjoyed spotting animals they knew and learning about new ones. It was especially exciting seeing the animals we might get to see on safari the next week although the kids preferred the dinosaurs. Inside the South African Museum is Cape Town’s Planetarium. This is a great choice of the indoor activities for kids in Cape Town. The Planetarium is well set up and shows many films including ones especially for young kids. We went to a show (that was coincidently Australian) about a dog and kids exploring the universe in a dog kennel. The kids loved it. Following the show was a demonstration of what we would be able to see in the night’s sky that evening. It was fun to see it all in the planetarium then try to spot the constellations and planets that night. Ticket costs vary depending on the show. We paid ZAR120 for 1 adult and 2 kids. You can find information about the latest shows here. 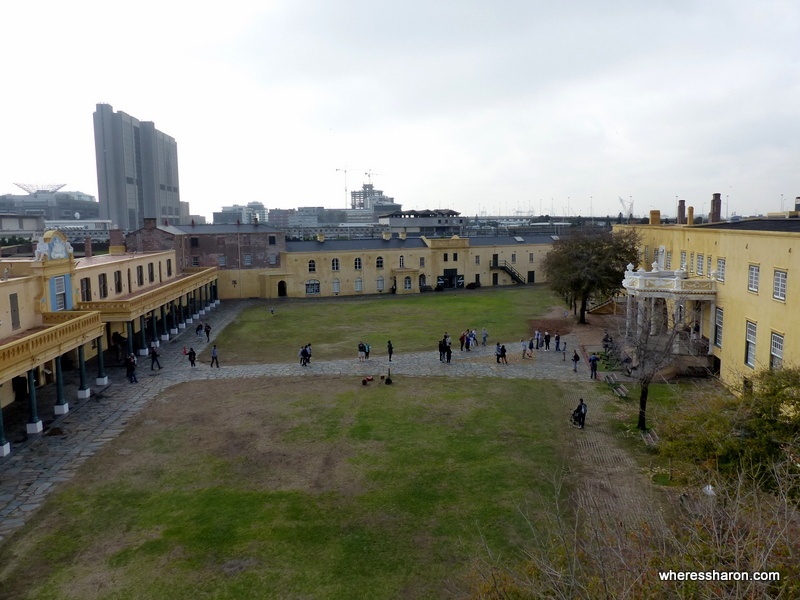 The Castle of Good Hope was built by the Dutch between 1666 and 1679 and is definitely one of the must see places in Cape Town which works very well for kids. This stone walled castle makes for quite a sight and walking around the top and exploring the castle makes for fun things for kids to do in Cape Town. There’s also a regular cannon firing which the kids loved. The castle is quite extensive with passage ways where you can feel a bit lost. There are some museums on site including a Military Museum and ceramics. There are regular included tours as well although we found it less stressful to explore at our own pace with kids. When we visited, entry was ZAR30 for adults and 15 for kids. 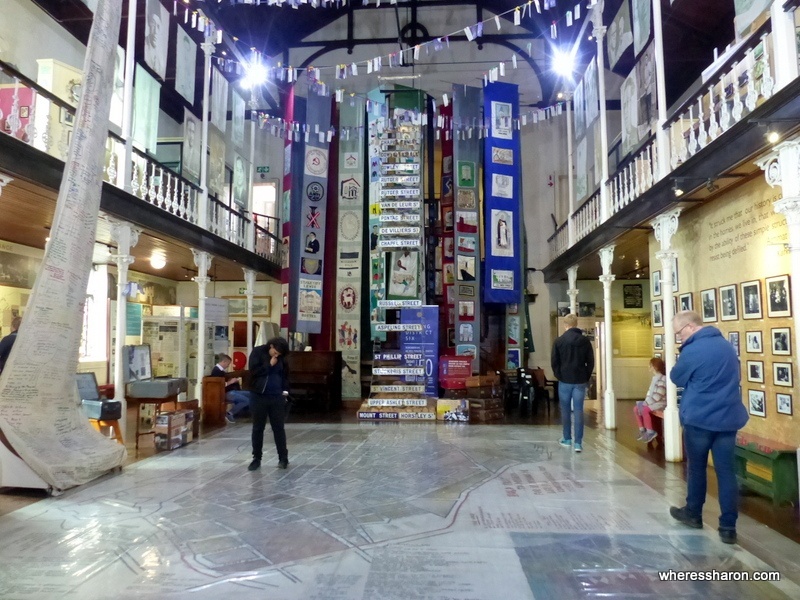 The District 6 Museum is an eye opening look into the affects of apartheid through the eyes of previous inhabitants of District 6, an area which was a lively multiracial area until the inhabitants were forcibly removed and the area destroyed. The personal stories and information in this museum really helped me to understand this era of recent history. For a slightly higher entry price, you can have an ex-resident guide you around the museum. I highly recommend this. The stories were highly insightful and interesting that I heard. 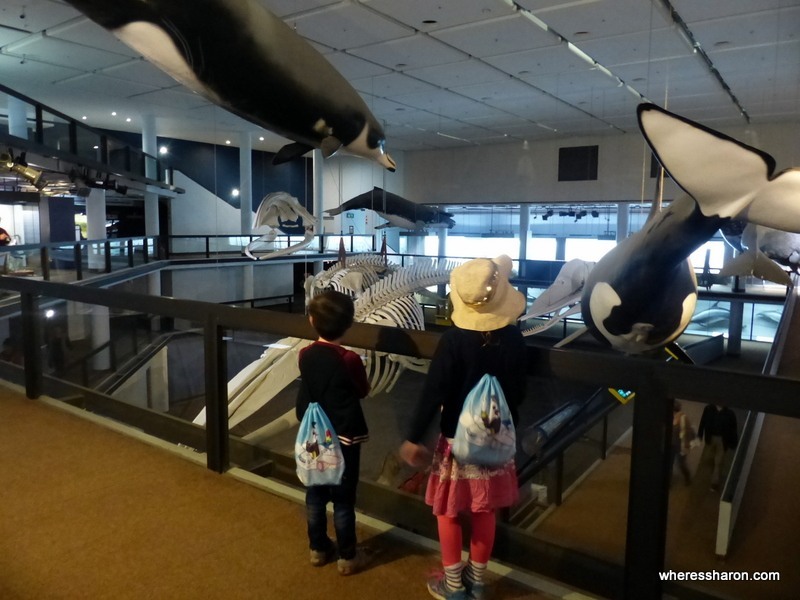 While not really one of the kids’ activities in Cape Town if you have younger kids, like us, our kids were entertained enough by the map on the ground and the more colourful exhibits that we were able to take in the information in this museum. When we visited, kids were free and adults ZAR30. 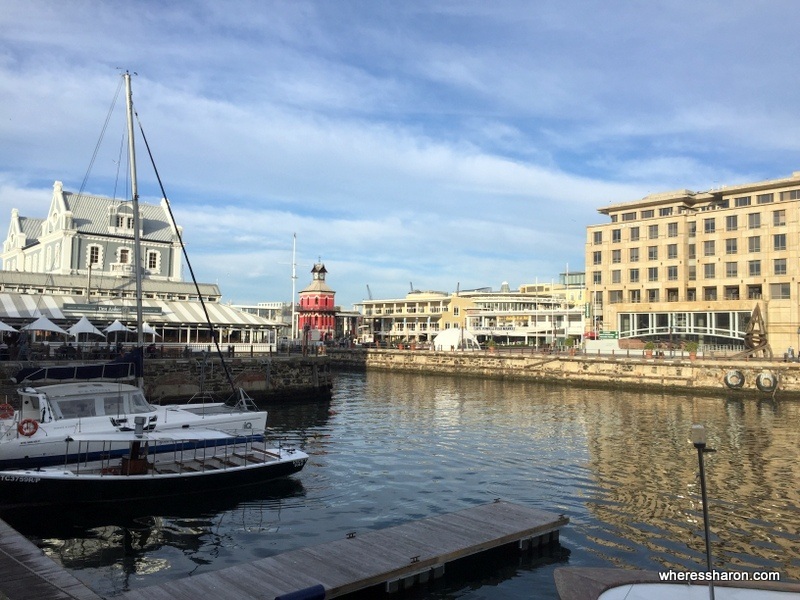 The waterfront area is a bustling, pretty, fun place with plenty of things to do for kids in Cape Town. In addition to the aquarium, listed below, there was also a reptile park, playgrounds, Cape Town Wheel and ice skating when we visited. In addition to this, there were many sculptures, Nobel Square and many shops and restaurants. It would be nice to spend some time eating, shopping and doing some of the fun activities for kids in Cape Town here. No ocean city is complete without an aquarium, it seems, and Cape Town has the Two Oceans Aquarium located at the V&A Waterfront. It’s a really kid friendly aquarium, featuring aquatic life local to the cape. 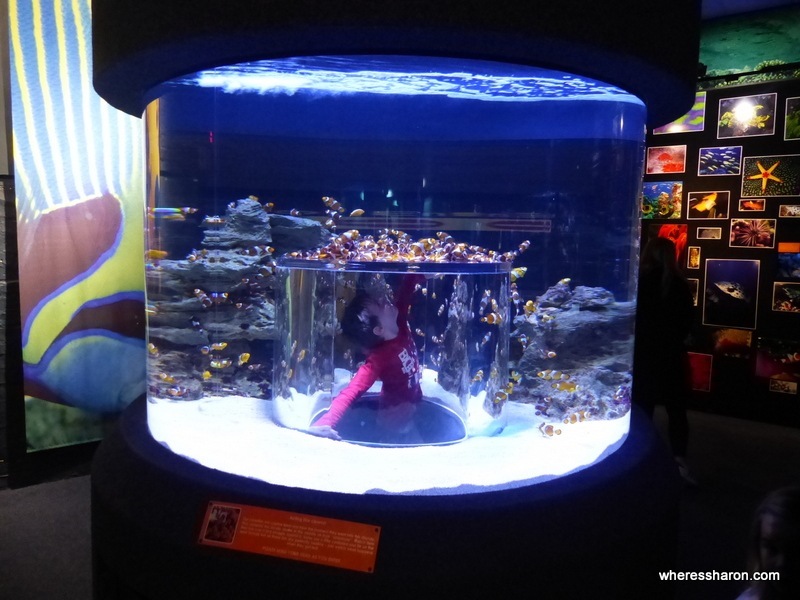 What makes this aquarium so great for kids is how much of a focus there seem to be in the design of the exhibits. So many tanks could be crawled into or were interactive in some way. They were well lit and easily viewed and many were more than just a big tank in the wall. Even J could get into some of them, reaching out to point or to try to touch the jellyfish, anemones or stingrays. The touch tank was a big hit. There was a friendly helper available that explained to Z what he was touching in the tank and how to touch it. There’s also a kids’ play area on the bottom floor where Z had a great time decorating shark biscuits with edible ink pens and J liked crawling around and trying to help Z with the big puzzles. It’s a good place to go if you are looking for things to do with toddlers in Cape Town. On the top floor is the penguin section (which also has multiple feeding times a day) and an interactive games area on recycling and water conservation. These were as big a hit as the fish. We moved pretty quickly through the aquarium and took an hour to get around. Going slower, we could have spent a couple of hours or more. There’s actually not a huge amount of fish but there is a good amount of things to see. Given the price it’s a great value kids things to do in Cape Town. We really liked our visit to the Two Oceans Aquarium. At the time of writing entry is ZAR 160 for adults and ZAR 75 for kids over 4. 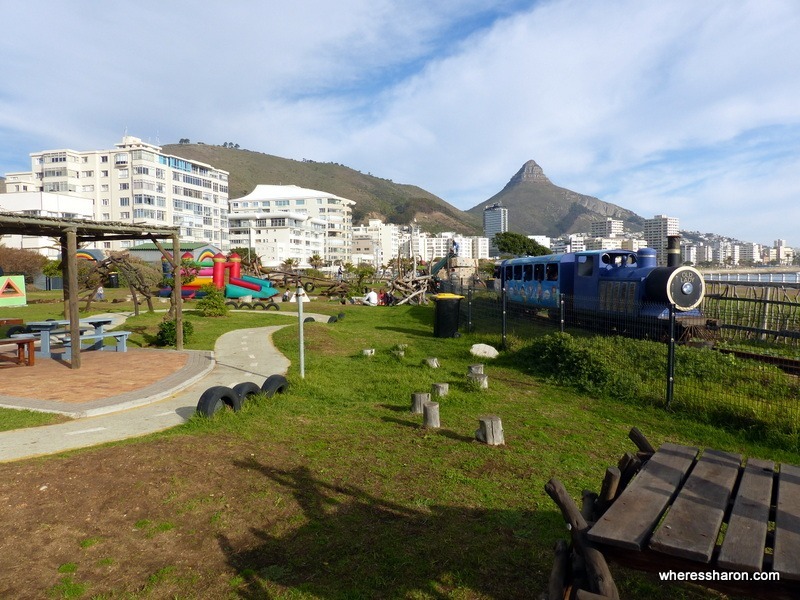 Close to the Green Point Lighthouse lies this awesome playground: the Blue Train Park. With beautiful views of the Atlantic Ocean, this park combines an adventure playground made out of recycled materials and a small miniature scale train that goes around the outside. Looking a bit like something made from a bunch of really big sticks the playground just looks fun and it was as good as it looked. S and Z loved the train, which did three loops, but also enjoyed the other equipment. There is a lot to play on, including a zip line, bouncy castle, kids’ rock climbing wall as well as the usual money bars, swings and slides. There were even a couple of things that baby J could enjoy although he was too young for most of the equipment. There’s also a more conventional playground – smaller but still pretty big – almost adjacent to the Blue Train Park, for when one playground isn’t enough. S and Z loved it and needed to be bribed away. These are activities for kids in Cape Town that is worth putting on your itinerary. Facilities wise, the ticket office also sells snacks, ice creams and drinks but, annoyingly, there is no toilet. A public toilet lies next to the adjacent playground about 100m away. You can buy entry to the park and a ride on the train for ZAR 20, or two rides for ZAR 35 per person. It’s unclear if you need to pay just to enter the playground without a ride but no one was checking tickets. 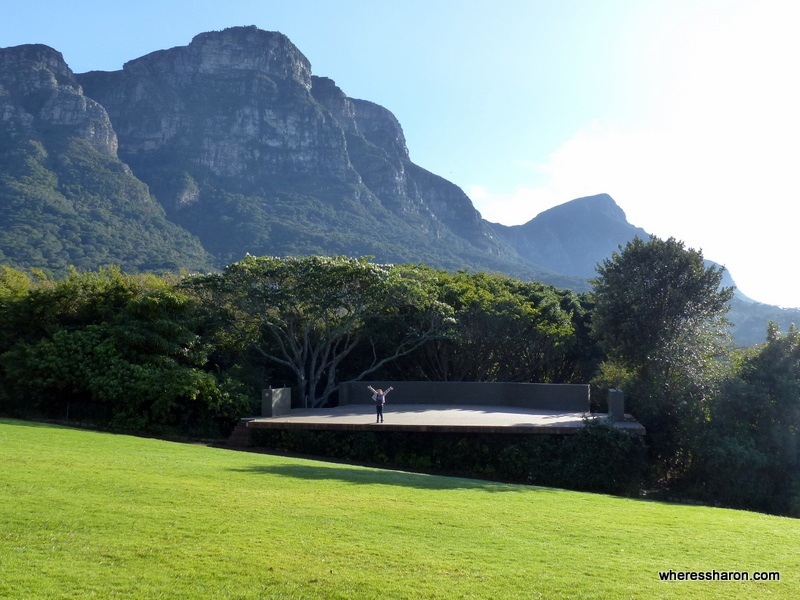 Once part of a large estate owned by Cecil Rhodes on the lower slopes of Table Mountain, the Kirstenbosch Botanical Gardens is one of the best botanical gardens we’ve visited and, even for our kids who are not naturally inclined, one of our favourite of the fun things to do in Cape Town for kids. The gardens are huge – covering 538 hectares of which 36 are cultivated and laid out. The gardens and lawns are beautiful and are made even better by the great views in all directions – Table Mountain one way and the city centre the other. Given the size of the park there are lots of different sections. Our favourites were the canopy tree walk, elevating you above the tops of the trees (and more great views) and the fragrance garden where the kids enjoyed smelling and feeling different types of fragrant plants (more fun than I make it sound). However, what the kids liked most was just exploring and running around. There’s lots of paths with twists and turns and getting lost then found was a big thrill. You can bring a stroller but there are many uneven and off road paths so it’s not ideal. We really enjoyed our visit to the Kirstenbosch Botanic Gardens. 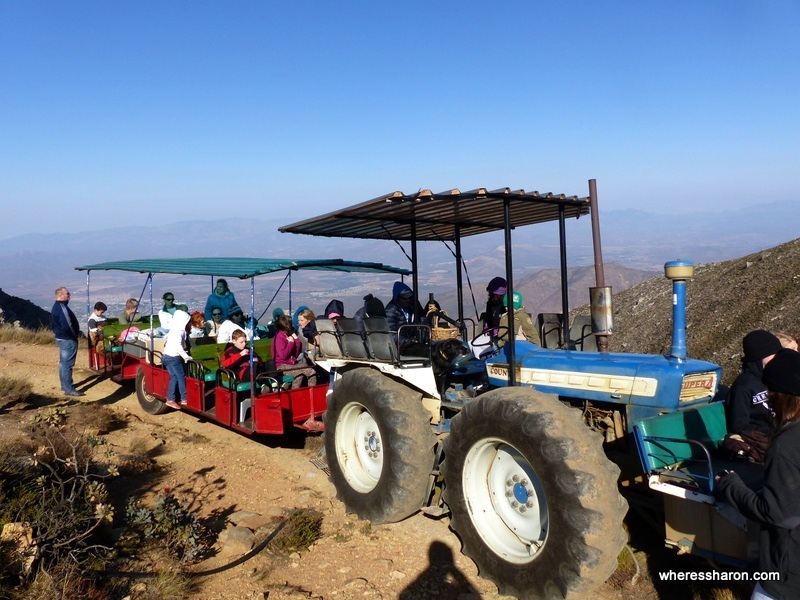 It was a surprise hit with its great views while being made for exploring and definitely one of the top Cape Town kids’ activities. 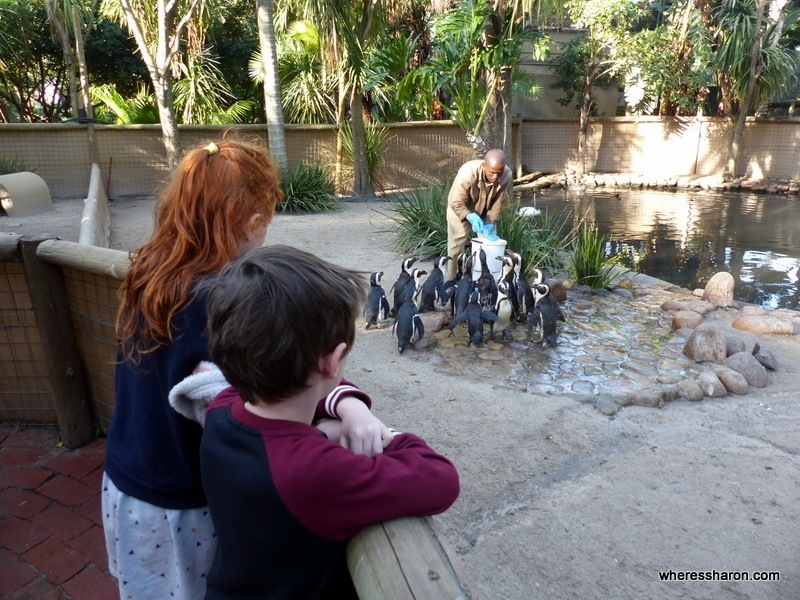 Cape Town’s World of Birds is a surprisingly good bird park and definitely worth adding to your list of things to do in Cape Town for kids. This well presented bird park is home to over 3000 birds and other animals. There’s a lot of walk in aviaries as well as a “Monkey Jungle” where you can walk through a monkey enclosure as well. We loved seeing the birds up close, watching penguin feeding, getting close to tortoises and seeing meerkats. We have been to many bird parks and this did stand out as just having so many species and the ability to get so close to them. See the latest ticket prices here. Take note that Monkey World has limited opening hours and we found it hard to find inside so ask for directions if it’s about to shut. 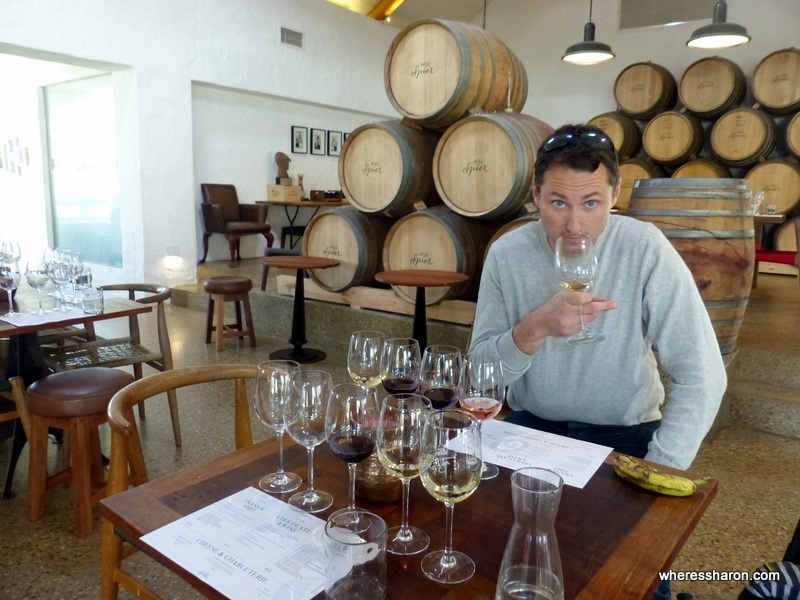 Visiting a winery may not be the first thing that pops into your head when you are thinking about what to do with kids in Cape Town but it is a fun activity. 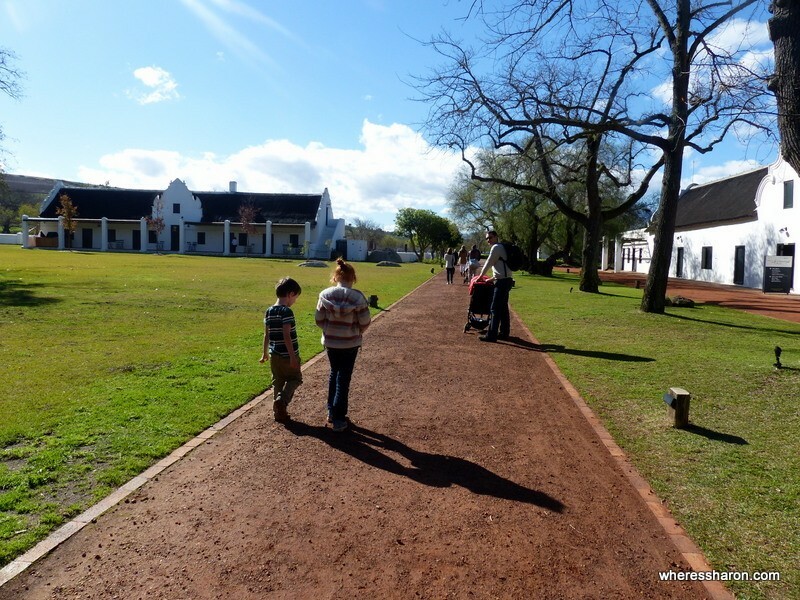 We visited Groot Constantia as part of our City Sightseeing bus ticket and it was a huge hit. This wine estate is the oldest in South Africa and it’s incredibly picturesque. It’s also a practical choice as there is a restaurant, deli, cellar tours, wine tasting and a historic manor house. We ate an absolutely superb lunch at the on site, Jonkerhuis Restaurant. There is a great kids’ menu and high chairs available. We were able to sit outside which was lovely and also meant the kids could run around while they were waiting. We were certainly not alone in eating here with kids. There are, of course, many wines to choose from and this was an easy way for Josh and me to try some wines. We also looked around the manor house and did the cellar tour. It was quite quick, but informative, and worked with the kids. 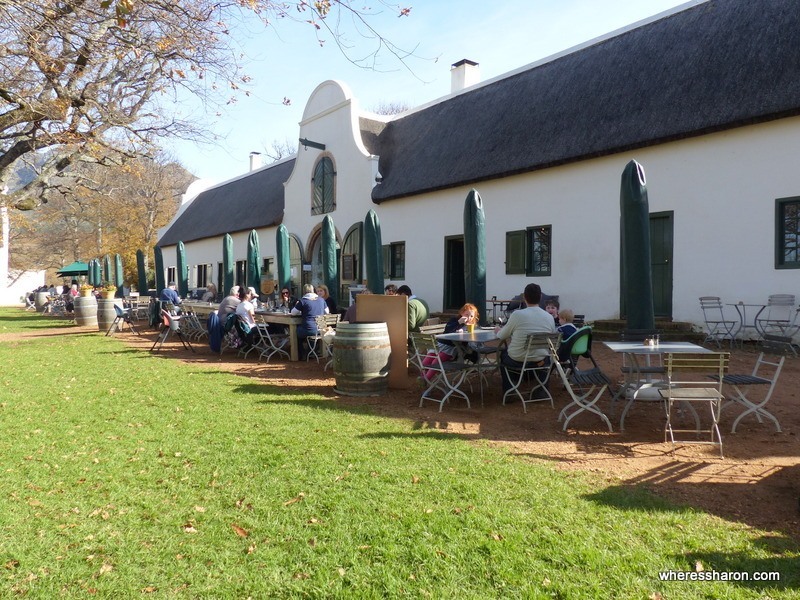 The cellar tour, manor house and tastings require a ticket which is ZAR95 for adults and free for kids. You can walk around parts of the winery and visit the restaurant without paying for the ticket. It’s very easy to visit here on the City Sightseeing bus. Townships loom large in South Africa, both past and present. 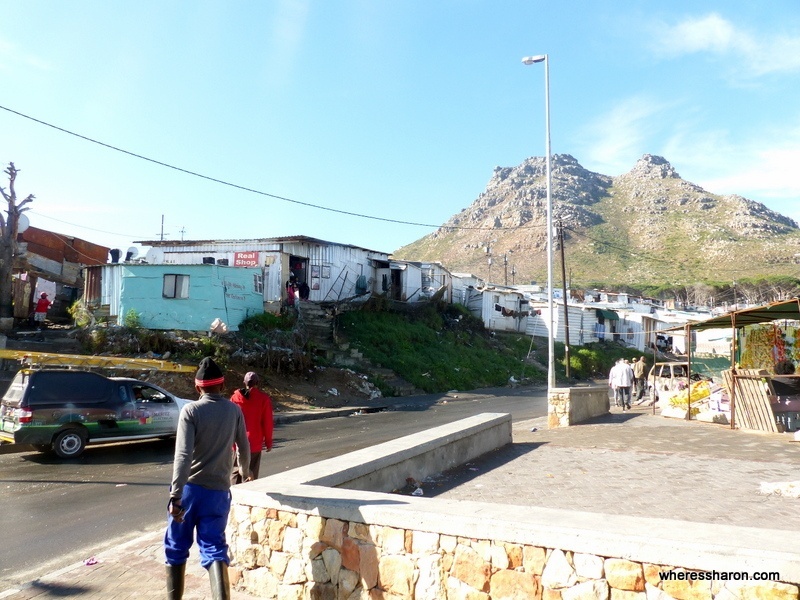 As part of our hop-on-hop-off bus tour we took a tour of the township of Imizamo Yethu, located in Hout Bay, Cape Town. 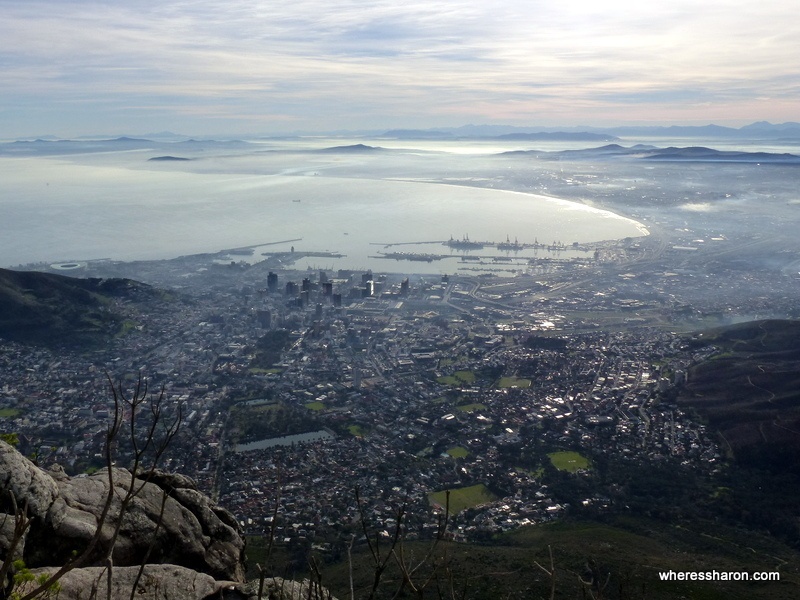 It’s one of the most interesting and enlightening Cape Town things to do. Now visiting a township is probably not one of the first things on your mind when thinking about places to take kids in Cape Town but we wanted our kids to see another side of life. That destinations we visit are not all hotels, attractions and wonderful things. I hope to bring them up with a social conscious and that they will also realise that most of the world do not live how they do. The tour took us through the township and showed us the miserable conditions that people live under. While some families present prior to 2000 have received new permanent homes and others’ temporary homes resembling large garden sheds, newer arrivals (and people keep arriving in order to find work) make do with structures made out of whatever they can find. Families live in two small rooms with a motley collection of furniture, sharing fridges, sharing toilets with fifty people and a single tap of running water. The buildings are cramped close together and fire is a constant risk. Still, there was some hope. We were shown the shops that spring up in order to sell whatever skills or services the residents had to make money (unemployment runs at 40%). We saw the day care centre and the community centre where there was a program for the school holidays. The kids loved meeting us and our kids. The tour lasted an hour and we were guided back in time to catch the next hop on hop off bus. Saftey wise, we had no concerns even with the kids. People were curious and friendly or just ignored us. I (Joshua) have to admit I had my qualms about going. Having toured a favela in Rio de Janeiro with Sharon it felt like going through a human zoo, like some sort of voyeuristic peer into poverty. Morally – to me anyway – it seems a bit wrong somehow but it’s a decision for each person to make. We talked to our guide about this. She is a resident of the township herself. She said some residents do object to the tours, but they are in a minority. Most want people to see the reality of how they live in the hope that it will help bring about change and they have found that it does help. My moral reservations aside, the tour of Imizamo Yethu was an incredible insight into a major and often hidden side of contemporary South Africa. I have no doubt that S and Z got something out of the experience as well. For them, it was highly educational. 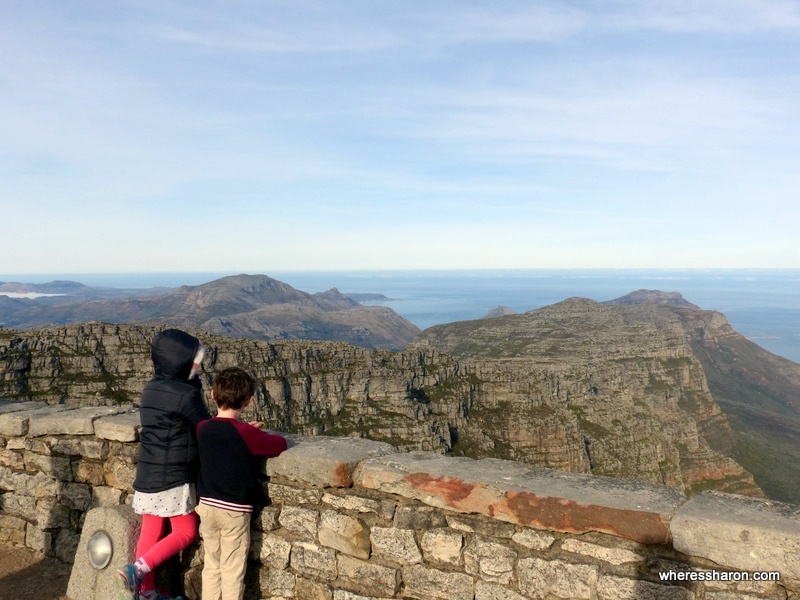 It may not be your first reaction to where to take kids in Cape Town but we found it worthwhile. You can read more about the tours here. There are some beautiful beaches in Cape Town and they are definitely fun places for kids in Cape Town even in winter when we visited. Camps Bay is one of the choices. It’s a pretty stretch of beach with lots of nice eateries and shops facing the ocean. Taking a picnic is also a good option. 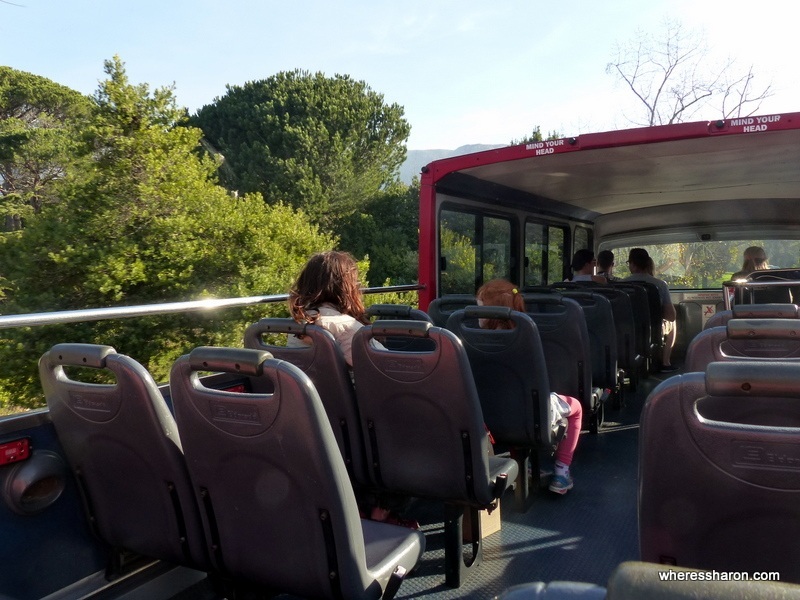 It was very easy for us to visit many of the things for kids to do in Cape Town above because we bought tickets on the City Sightseeing Cape Town buses. These are the double decker variety of hop on hop off buses that are in many cities of the world. We found them particularly good in Cape Town because they are a very reasonable price and run very regularly – even in winter on a week day. 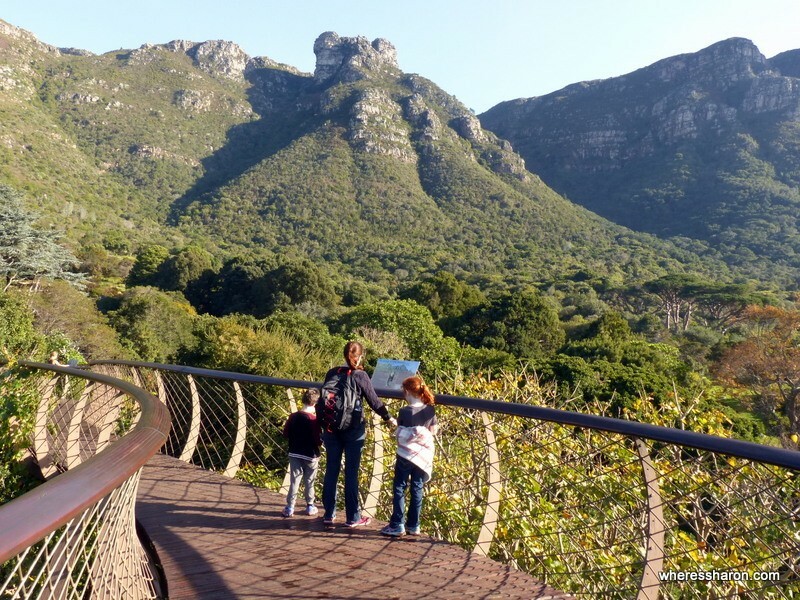 They have three different routes as well as a wine route in Constantia and all the above family activities in Cape Town can be visited on them. The kids loved being on the double decker buses which helped them to stay keen to see and do more. We all enjoyed listening to the commentary on the way around which gave us adults a chance to learn more about Cape Town and helped keep the kids occupied. Another of the things to do in Cape Town with family is located just outside the city in Paarl, an easy 45 minute drive away. This place is perfect if you love trying new foods and drinks. Spice Route is like a village of good food options! It’s set up like a village with lots of little buildings on a compact site. It’s very easy to walk between them to taste and learn about different things. Each store consists of a different artisan with a different product so they all complement rather than compete with each other. It’s lots of fun. There’s the Spice Route tasting room where you can try wines. If you are interested in more alcoholic beverages, there’s a distillery and brewing company. For more kid friendly options, there’s a chocolatier, cured meats, glass blowing, deli, biltong and so much more. All up, there are 13 options. There’s a playground as well. Many of the food options have their own tasting experiences. We were able to try the biltong for free but other options had a (very reasonable) price attached. We did a wine and cured meat tasting, tried biltong, ate lunch at the pizzeria and finished off with chocolate tasting. The kids were in heaven with the last choice! The pizzeria was also very good and we had a delicious meal. They also have kids’ options and high chairs. This is a very easy place to spend a lot of time. Each store has something to discover and it’s incredibly well set up. We loved it! 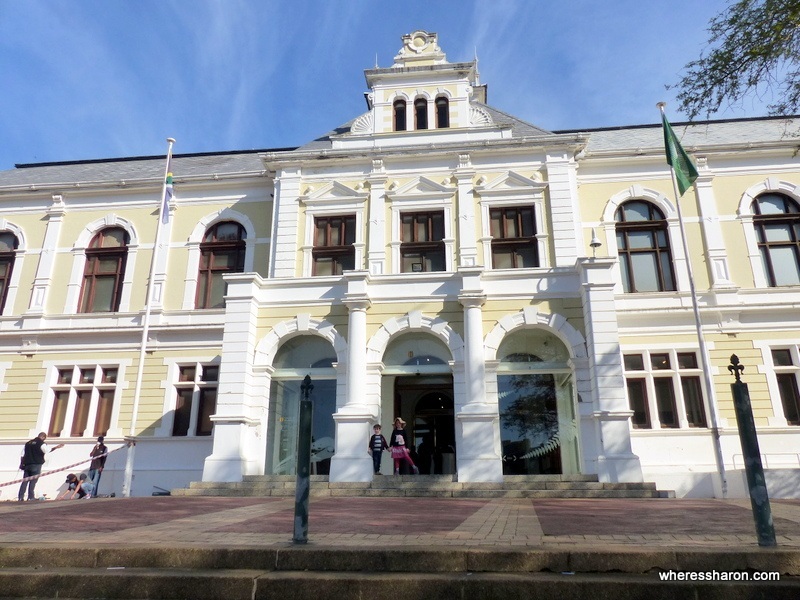 Stellenbosch is another town an easy drive from Cape Town which is full of fun family activities. Better known for its wine farms, Stellenbosch is also about 45 minutes away. Many of the wine farms are suitable for families with grape juice tasting, playgrounds and other attractions. There are also many other things to do with kids including a Monkey Farm, Butterfly Farm and a Toy and Miniature Museum. We enjoyed the Toy and Miniature Museum and visiting the different attractions at the wine farms. Spier was a particular hit. Here you can do the usual, like taste wines (while the kids colour at a special kids colouring table), play in a playground and explore beautiful grounds. We also had a good lunch and enjoyed visiting Eagle Encounters. Here we were able to get close to owls and eagles that the centre rehabilitates and to learn more in a bird show. We highly recommend it. We also enjoyed the family fun activities in Cape Town at Vredenheim wine farm. 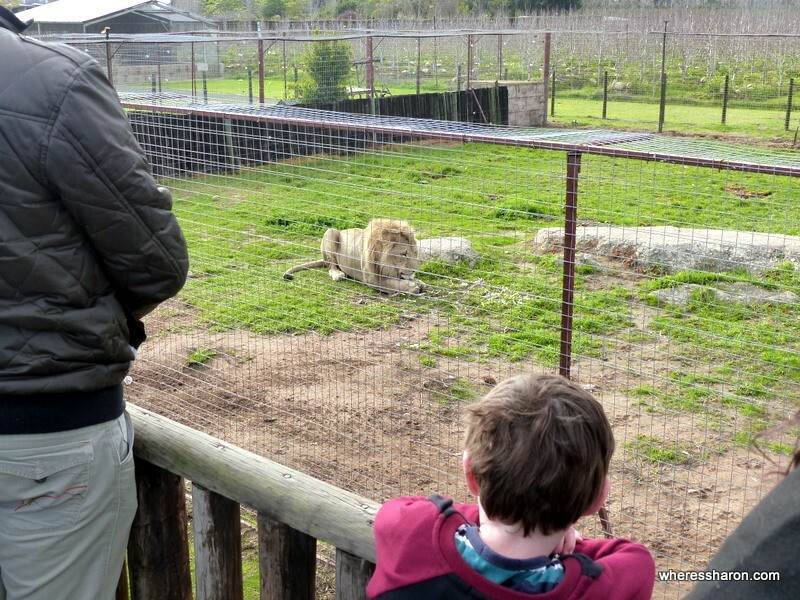 The wine tasting and grape juice was good, but even better was the Big Cats Park. 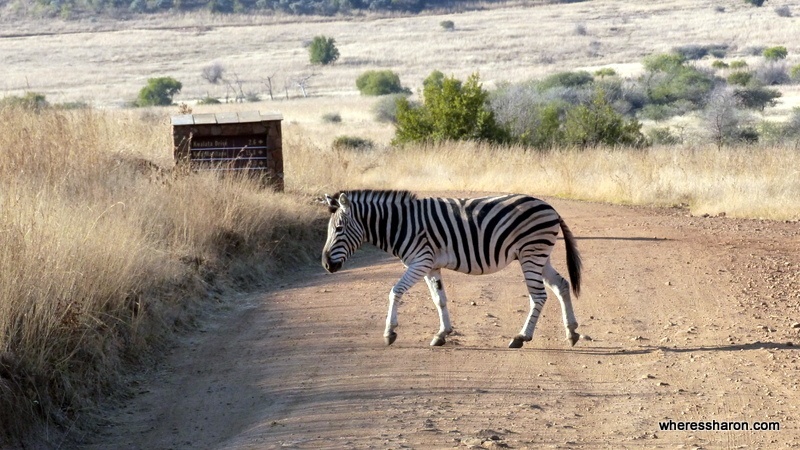 Only in Africa do you drive past zebras on your way to wine tastings where there are also lions, tigers and a leopard! We were also lucky enough to arrive here at the right time for the big cat feeding. It was very interesting and I have never been so close to such active members of these species. We loved visiting Stellenbosch. 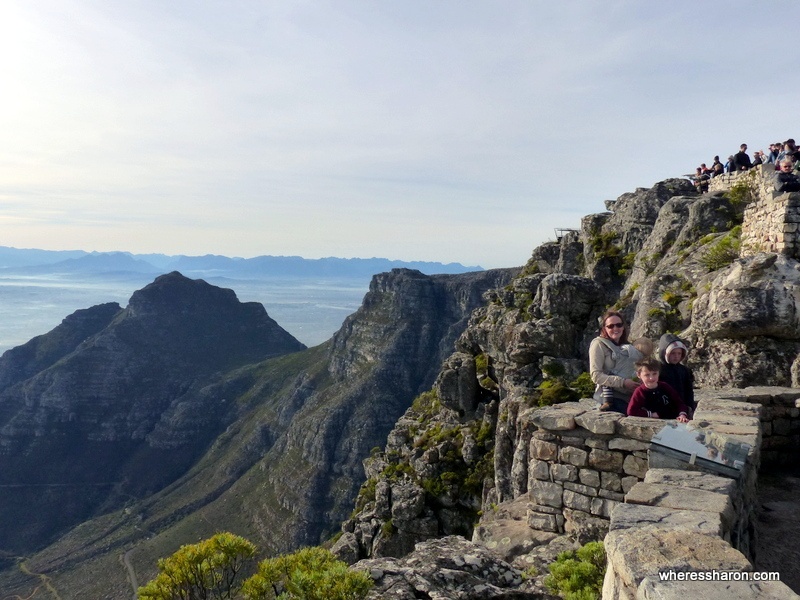 It’s incredibly family friendly and worth squeezing into your Cape Town family activities. If you are looking for events in Cape Town, you can find a list here. Stellenbosch is close enough for a day trip or you can also stay overnight. We actually spent three nights here after our time staying in Cape Town and just loved it. If you take this option, we recommend StayBosch. These family run apartments are awesome. For a crazy good price, we stayed in a two bedroom apartment with full kitchen, living area and our own patio. We also had access to a pool, playground and the owner’s playroom. There are also laundry facilities. It’s in a great location just a couple of minutes walk from shops and restaurants and walking distance to the centre of Stellenbosch. We especially appreciated the baby equipment that the owner provided for us. We had a change mat, baby crib and high chair. We stayed in the central downtown City Bowl area. This made it very easy to get around as we could walk to the central places to go in Cape Town and we were on the City Sightseeing bus lines to go everywhere else. While we were based in Stellenbosch, we had a car to get around. Gardens Centre Apartments – if you’re on a tight budget, these apartments are a super affordable option for families and are located in close proximity numerous attractions such as the South African Museum. There’s a fitness centre onsite, as well as a restaurant and plenty of other eateries nearby. Click here to see the latest prices. Cape Royale Luxury Hotel – for families looking for additional comfort, this hotel offers luxurious and large rooms with both 2 bedroom suites and quadruple rooms available. A swimming pool, fitness centre, spa and restaurant are onsite. There’s also a kids club and babysitting services available. Click here to see the latest prices. Lagoon Beach Hotel & Apartments – a lovely hotel with commanding views over the ocean. 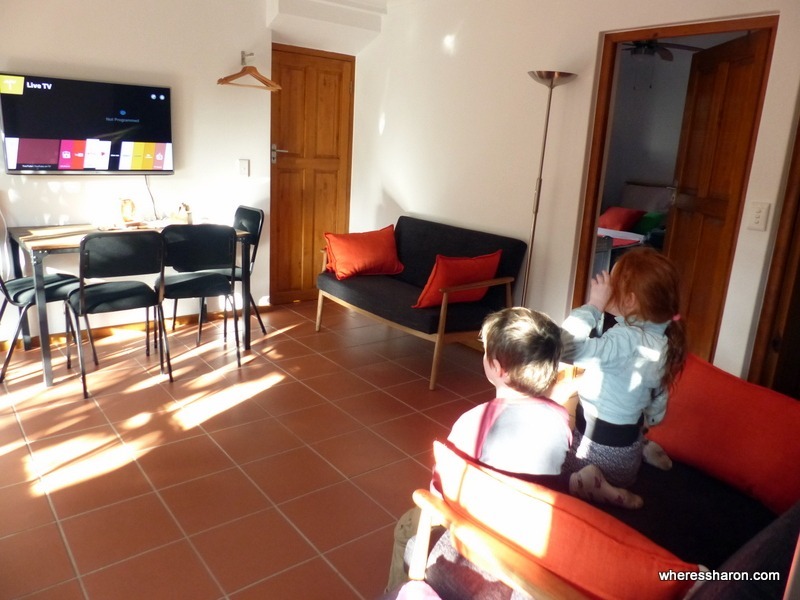 Families can choose either self catered suites or apartments, and the hotel also has a spa, free parking and a babysitting service. Click here to see the latest prices. 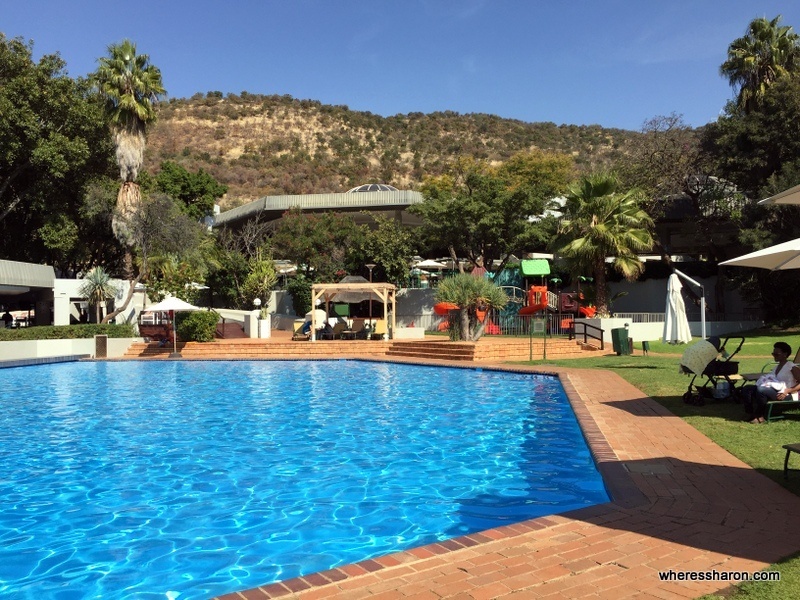 Mandela Rhodes Place Hotel and Spa – ideally located in the city centre, this hotel offers families affordable and well sized two bedroom rooms, great views, a babysitting service and an onsite restaurant. It’s ideal for exploring Cape Town’s many central attractions. Click here to see the latest prices. It looks just spectacular. I really can’t rave enough about the views. It’s not just about Table Mountain, however. There’s beautiful coastline, cliffs and just views everywhere. The people are very friendly. It’s definitely up there as one of the friendliest places I have ever visited especially for such a large city. On that topic, it really doesn’t feel like a city of nearly 4 million people. I’m still surprised that it is. We visited in the middle of winter and found the weather to be very mild. We took thick jackets but never wore them. It was much more pleasant than our home city of Melbourne. It’s also very interesting with a wide range of attractions and fun things to do in Cape Town with kids. We had fun exploring and learning together. It wasn’t just fun though. “Attractions” like a Township walking tour and the District 6 Museum are eye opening and moving. All in all, we just loved Cape Town. It’s beautiful, friendly, great value and has so many interesting facets. I can’t wait to return! You can also read our guide to Robertson and Montagu. 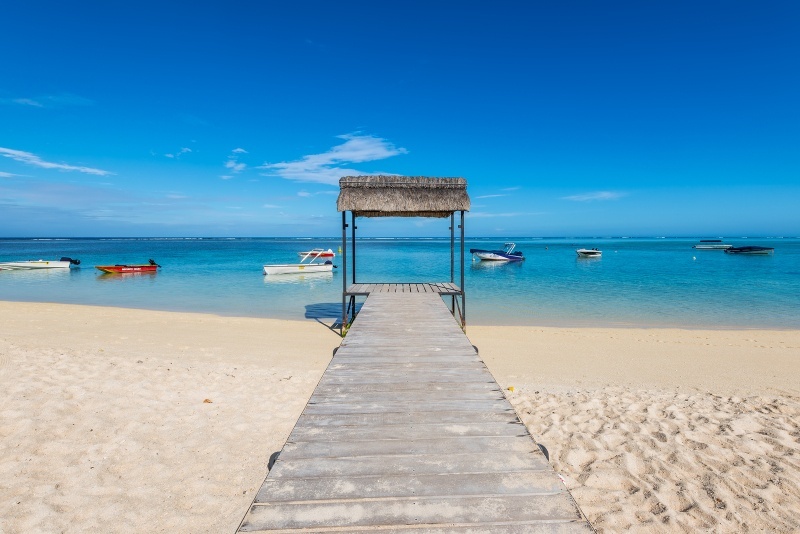 These towns are just a couple of hours drive from Cape Town and worth a visit! And our experiences going on safari in South Africa with young kids here. Any questions? What are your top places to visit in Cape Town for kids? Wow, you did Cape Town well. Glad you didnt skip the wine farms! Next time hopefully you get to come in the summer but i think its not so bad you came in July as you missed tourist season. Great write up of my home town ? Thanks Matt! Yes, I’m very happy with when we went. It was sunny and lovely weather and no crowds. Just loved it though so I’m sure we will be back at some point.